Newly restored from two 35mm negatives and incorporating the color tints and tones of the original release prints, this definitive edition of The Thief of Bagdad features silent film score maestro Carl Davis conducting the Philharmonia Orchestra, performing a magnificent score that intermingles Davis' own music with the iconic Orientalia of Rimsky-Korsakov. 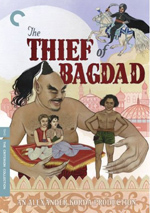 While probably not as well-known these days as a 1940 adaptation by the same title, 1924’s The Thief of Bagdad was a huge hit in its era – and also regarded as a classic. We meet the title character (Douglas Fairbanks) as he plies his mischievous ways. Smart and agile, he evades capture and punishment, and he lives only for himself. That’s the case until he meets a princess (Julanne Johnston), the daughter of the caliph (Brandon Hurst). The thief decides he must have her, so the film follows their romance and related adventures. While modern audiences often find it tough to get into any kind of “old movies”, I believe silent films require the biggest leaps. Granted, one must readjust expectations when one sees any film from earlier eras; styles vary so much that one has to understand and adapt to those shifts to enjoy the efforts. But silent movies go to an extreme due to the lack of speech. With no ability to say lines, the actors often had to go tremendously broad to convey thoughts and feelings. For audiences accustomed to more natural performances, it can be hard to get used to these stylistic choices. Which is why the silent movies that have endured the best tend to be comedies. Those films could utilize physical gags that still amuse today, so they hold up much more easily. Logically, the genre second-best suited to the silent screen should’ve been action/fantasy. There’s a reason Hollywood action flicks sell well in non-English markets: they don’t need to translate much dialogue. This means silent films should also be able to give us fun despite the lack of speech. Theoretically, that is, but in the case of Thief, I can’t say I come away from it terribly entertained. When I go into silent movies, I really do try my best to get into the spirit of the era and its styles. As I alluded, I don’t expect performances that would work today, and I certainly don’t demand visuals that match modern efforts. Though the production design of Thief actually holds up pretty well. Of course, the effects look clunky, but they’re strong for their age and never force us out of the film; while primitive, the effects still work. Thief looks great in other ways, too. It comes with elaborate production design and seems to put its budget on the screen. Even though we can tell we’re stuck in soundstages, the sets offer lush environments that allow the movie to come to life in a fanciful manner. Too bad the film itself takes forever to go anywhere. At times, I wanted to ask if we’d get any action or fantasy in this action/fantasy, as we must wait a long time to find much of either element. The flick lasts almost two and a half hours, but the thief doesn’t embark on his quest until around the 90-minute mark. P> That forces a slow build-up. I realize that silent films often need more time to progress than “talkies” because the dialogue cards add to their length, but the plodding nature of Thief really does make it drag. Actually, the cards aren’t even a big factor in the running time here; with a general lack of dialogue, Thief uses fewer than expected, so the sluggish pacing is the biggest problem. Once the thief does go on his merry way, the story improves a bit, but to a large degree, it feels like too little, too late. We’d need some truly splendid action/fantasy pieces to compensate but I don’t think what we find here really qualifies. While I like the fantasy scenes well enough and think they’re good for their era, they don’t elevate the movie to the necessary degree. They show some sparkle but can’t force the tale out of its rut. I also admit that Fairbanks did little for me. Oh, he looked great, as the actor was in amazing shape, but I think he was too old for the part; then 40, the role seemed better-suited for someone half that age. In addition, Fairbanks went awfully broad as the thief. Even for silent films, his performance felt hammy and over the top. Take the absurd way he rubs his stomach to indicate hunger; acting like that seems more at home in a pantomime play for two-year-olds than in a feature film. Of course I accept and expect broad performances from the silent era, but Fairbanks plays everything to the 10,000th degree. It’s probably not helpful that the thief lacks much of a personality. In truth, he comes across as a bit creepy, such as when he leers at the princess; I suppose this is supposed to connote love, but Fairbanks just looks like a perv. The character never becomes engaging in the slightest; if we root for him, it’s because we’re supposed to do so, not because we like him. On the other hand, Sôjin’s turn as the evil Mongol Prince works quite well. The best performance in the flick, he exudes menace and intelligence. Sôjin brings the film to life whenever he appears. It’s too bad Thief isn’t about him, as that would be a much more interesting experience. While I can respect and appreciate some aspects of Thief of Bagdad - especially in the technical domains – the film just doesn’t entertain me. Even when I attempt to see it through “1920s eyes”, it leaves me cold. The Thief of Bagdad appears in an aspect ratio of approximately 1.33:1 on this Blu-Ray Disc. Though clearly a product of its time, the movie looked good. Sharpness had uneven elements and could be slightly soft at times. Nonetheless, overall definition was quite good, as even the occasional instances in which the movie was a bit fuzzy didn’t cause real distractions. Clarity held up nicely during most of the flick, as even the wide aerial shots looked pretty accurate and concise. I noticed no signs of jaggies or moiré effects, and edge haloes were absent. The film lacked substantial print flaws; I saw insignificant examples of lines on the sides and some batches of scratches – primarily in the Cavern of the Enchanted Trees – but not much. The image featured a good layer of grain, so it maintained the appropriate “film-like” appearance. Some anomalies popped up along the way – such as a “warping” during the scenes in which the thief first met the princess or some “flashing” around 91 minutes – but overall, the flick came with relatively few source-related issues. Like many silent films, Thief was in color, but just one color at a time. Scenes would vary from purple to green to yellow, for instance. These tones seemed adequate for what they intended to represent. Blacks appeared reasonably tight and dense, and low-light shots were pretty clear. Some opacity came with the latter, but not to a substantial degree, so the shadows remained clear and viewable. I felt impressed by the film’s restoration, as it made a nearly 90-year-old work look good. In terms of audio, one wouldn’t expect much from a silent film, right? Indeed, the DTS-HD MA 5.1 soundtrack of Thief omits any speech or effects. However, Thief does come with a score Carl Davis wrote in the 1980s. In this recording, the score shows nice vivacity and heft. The music came from the various speakers in an involving manner that allowed it to fill the soundstage. The DTS-HD track reproduced the music well. A few extras fill out the set. We find an audio commentary from Douglas Fairbanks biographer Jeffrey Vance. He delivers a running, occasionally screen-specific look at the movie’s roots and development, aspects of Fairbanks’ life and career, cast and crew, sets and production design, stunts and action, costumes, effects and cinematography, the film’s release, reception and legacy. For about the first 45 minutes or so, Vance provides an informative, enjoyable look at all these subjects. After that, however, the pace slows and the commentary becomes much spottier. On occasion, Vance throws out an interesting note or two, but those instances turn rare; instead, we usually get silence or a basic description of the on-screen action. If you listen to this track, I’ll vouch for the initial 45 minutes or thereabouts; after that you’re on your own! Vance pops up again for a “video essay” called Fairbanks and Fantasy. It goes for 17 minutes, seven seconds as the author provides text to accompany stills. We see shots from the set as well as other photos along with Vance’s written discussion of various filmmaking topics. Some of those notes echo material already heard in the commentary, but we still learn some new facts, and the images add a lot of value, as they give us good behind the scenes elements. The disc opens with ads for The Other Son, Farewell, My Queen and Tristana. 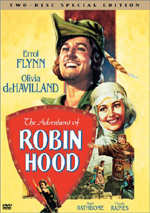 We also find a 2012 Restoration Trailer for Thief. A 12-page booklet completes the set. It offers some photos and credits along with an essay from North Carolina Museum of Art film curator Laura Boyes. It doesn’t compete with the booklets from Criterion, but it gives us some useful material. 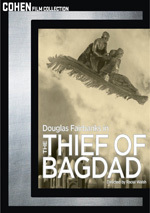 Although 1924’s The Thief of Bagdad enjoys a reputation as a classic, I can’t say the movie does much for me. I like its production values but think it moves slowly and suffers from a campy lead performance. The Blu-ray gives us good visuals and audio along with a few bonus materials. Though I can’t call myself a fan of the film, it does come to Blu-ray in fine fashion.